When we were dewy-eyed teenagers on study abroad programs, we looked forward to our encounters with other kids our age bars and train stations and the giggly struggle of language exchange that followed. We embraced the idea of cultural exchange and the awkward feelings that goes with it. Those who have children and want to raise them as competitive “global citizens” keep the spirit of cultural exchange alive by encouraging them in study abroad programs and other activities to increase their awareness. They don’t expect, nor would they coach these kids to only hang around with people from back home while they're in a foreign country. Yet many expats in Mexico, upon arriving to their own host country do just that. Many reject the notion that not learning the language of the country they happen to live in as a bit rude. What’s worse, not speaking Spanish cuts them off from friendships that would be just as gratifying now as they were when they were that 18 year-old on a Europass. Maybe one of the things that discourages adult expats is the idea that to make native friends they will have to be fluent. Fluency does require concentrated effort and time. Understandably, it’s harder to bear down on a challenging goal when you may not see an appreciable pay-off for several years. If you can get by in a restaurant or taxi, the effort of learning a second language is tempting to wave off if you believe it will take years. By taking certain steps, you can shorten the time it takes to make native friends while you’re coming up to speed on Spanish. They worked for me. It could work for you too. I think with a little modification, this might work. Three years ago, before I moved to Mexico, I decided to start attending Spanish practice groups in the U.S. Made up almost entirely of Americans, my practice group created a safe zone when I was trying to learn Spanish again after 35 years of nary a word. Seeing and failing miserably linguistically in front of the same people week after week creates a bond. We became good friends. By sticking with the Denver practice group for about a year, week after week, I arrived to Mexico with a reborn although still fumbling command of the language. Though not near fluent enough for spending an evening with a native speaker, the most important benefit was that it made me comfortable with my imperfection. Once I arrived to Mexico, it seemed natural to try to find a practice group in Mazatlán. What I had forgotten is that I would be speaking mainly with real Mexicans. Unlike my American group, the practice group in Mazatlán was a true exchange. Mexicans of all ages came to practice their English, which was, gratefully, as choppy as my Spanish. The dynamic of trying to practice another language while teaching someone yours in a group situation is difficult at times. To be honest, sometimes I wondered if it was helping me. Some sweltering nights, I would go to the practice at the oceanfront restaurant, which managed somehow to draw in none of breeze from the ocean across the street, only to find only one other person there. When too many people came, it was worse! Conversations were disjointed. Sometimes well-meaning people correct you so often you can’t keep a train of thought. Sometimes expats would come to meet each other and speak English the whole time they are there. But I learned an important lesson from my Denver practice group, which had similar distractions. If you keep going, something good will happen. Friendships are built as much on continuity of interaction than they are by commonality, as we all know from our work days. Day after day, little by little in the best way to form a bond. In my case, the good thing that happened was Lupita. She was charming, had interesting work and the clear lilting voice of a teenage girl. She only swooped in occasionally. I attended many meetings waiting like a love-struck girl for her return. I courted her in every way I could without have the advantage of fluency. Exaggerated facial expressions, stupid jokes, awkward compliments and complete undivided attention. Here was a real Mexican woman with whom I might become friends. I was shameless. Every other week her book club would meet just to socialize rather than talk about books. With time, she gradually became comfortable enough with me to invite me to one of those gatherings (I wasn’t quite ready to read and discuss Tolstoy in Spanish). The group get-togethers took the pressure off having to maintain long one-on-one conversations in Spanish, which can be mentally exhausting in the beginning. Bookishness and language learning just naturally go together. Several members were learning English in the book club and I made sure to practice a bit with them. Two years later, that circle of people from that book club makes up a the nucleus of my Mexican social group. Soon I began to receive invitations from them to cultural events like the opera or concerts, activities that wouldn’t require steady conversing. I think what they are really trying to tell me is that they want more wine. I reciprocate by hosting modest wine parties or buying tickets for cultural events; a play or a concert It was hard to stay ahead of them though. They kept reciprocating my reciprocation. That group has expanded out to include book club members’ sisters, their husbands and their adult children as little by little, they are included in my social gatherings, or I am included in theirs. “Group” is a key word in Mexico. You’ll never meet a Mexican woman without one. Not only do I love them, I also feel that I have a protective barrier that helps keep me safe as a single woman in a country where conversational nuance sometimes makes it difficult to immediately assess someone’s real personality. Whenever I meet someone new, I parade them in from of this circle for input. When in your own culture, you take for granted the miracle of communication. Choice of vocabulary, grammar, expressions, body language, all guide you towards determining what you need to know about that person beyond their words. In a less familiar culture, you lose much of that. Not that you can’t become friends with strangers you meet, but the process takes longer, just like learning the second language does. When I was a fundraiser, I remember one of my fundraising campaign chairmen, Allen Fergueson, saying during our capital campaign, “If you don’t know jewelry, know your jeweler.” It applied to standard fund raising campaign practices. Lupita became my jeweler. If the people I met were friends of hers, they were by extension, vetted. Even friends of friends of hers I considered vetted. I needed little more than an introduction to come out of the gate guns blazing, confident that person had something special to offer. Having moved to many cities cold, I have employed both methods, buckshot and laser, to make friends. The buckshot method, being everywhere, wears you out and can be expensive.If I were an efficiency expert and not a just a person seeking to make friends, I’d call this improved method, focusing on one or two people at a time, as the social equivalent of a bicycle - the most efficient machine ever built. To make friends in Mexico, spend your time finding the one or two Mexicans who interest you in your new city. Focus, invest and prioritize getting to know just one or two people at a time and you will probably gain the reputation as an expat worth knowing. Skype practice is fun, free and for everyone. My experience with My Language Exchange online Spanish practice. Next up: It's not the heat! - Tips for making it through coastal Mexico's looong summers. Most recent: What if the big medical bill you're dreading is for your dog? In Mexico, you may have nothing to worry about as vet costs are a fraction of what they would be at home. 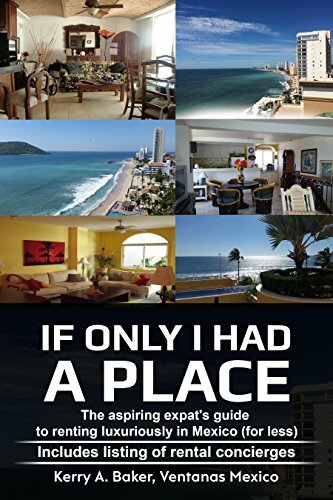 Hi, I am Kerry Baker, a partner with Ventanas Mexico and author of the "Interactive Guide to Learning Spanish Free Online, and most recently, "If Only I Had a Place," a guide to renting luxuriously for less in Mexico. Thinking of life in Mexico. Learning Spanish will enrich your life and save you money but takes time. Get started today with the Guide. Studying with your laptop or e-reader via interactive links to the best free language websites and features on the web. Create your own lessons or use those in the book.